If you’re a wine lover, you know wine should always be stored and served at the correct temperature. But storing your collection in your refrigerator isn’t practical, and it’s too cold for most bottles. An easy solution is the Magic Chef 12-bottle wine cooler. Here’s everything you need to know about this handy model. The Magic Chef 12-bottle wine cooler is a freestanding unit, weighing just under 27 pounds. While many wine drinkers find it the perfect kitchen countertop cooler, you can also use it elsewhere—suitable for the pantry, dining room, boat galley and more. Many buyers have placed this cooler in their vacation cottages too, where space is often tight. With measurements of just 19 by 14.2 by 20.1 inches, the Magic Chef cooler fits in spots where other coolers won’t. This cooler is sleek black on the interior and exterior. Four small feet on the bottom elevate it slightly, and the door handle is recessed. The door hinges are on the right as you face the cooler. This is something to consider if placing it in a small space, as the door swing is not reversible. 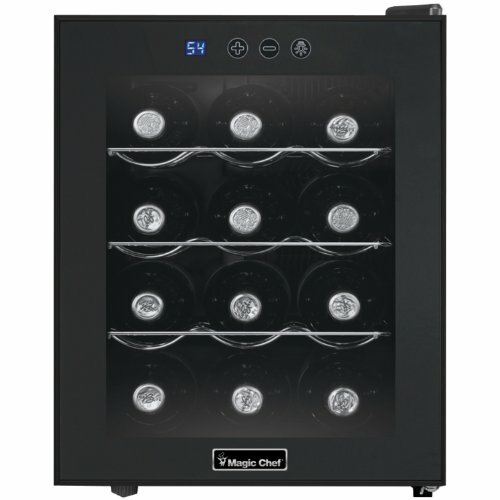 The Magic Chef 12-bottle wine cooler features three removable chrome racks. Each rack is sculpted to hold three bottles of wine. The remaining three bottles sit on the shaped floor of the cooler. This model offers quiet thermoelectric cooling, and the temperature is adjustable, between 54 degrees and 66 degrees Fahrenheit. There is no need for defrosting with this model. An LED display on the front of the cooler shows the current interior temperature. Easy buttons on the same control panel allow you to adjust the temperature in either direction. There is also a button to turn on an interior light for better viewing of the cooler’s contents. The Magic Chef 12-bottle wine cooler comes with a 6.8-foot, three-prong cord. It runs on 110-120 voltage and it’s advisable to plug it into a GFI (ground fault interrupter) plug. Users of the Magic Chef 12-bottle wine cooler are happy with the temperature range for chilling regular white and red wines. However, this particular cooler does not get cold enough for the ideal temperature for serving Champagne. The unit is not really configured for Champagne bottles anyway. If you buy normal sized bottles, these will fit nicely in the included chrome racks. However, you’ll have to get a bit creative if you want to store larger bottles, and magnums are out of the question. You can remove some racks to store heftier wine bottles. Another alternative is to take out all the racks and stand several bottles in the unit. At this point, though, a mini refrigerator is probably a better choice. The Magic Chef 12-bottle wine cooler does not instantly chill wine. When placing a warm bottle in the cooler, it’s best to give it time to reach the desired temperature. Ideally, this means putting your wine in the cooler at least a few hours before serving. In addition to its convenient size, this model is appreciated for its quiet motor. Users also like that it doesn’t seem to affect their utility bills by any noticeable amount. The Magic Chef 12-bottle wine cooler doesn’t need to house only wine. You can also use it to chill water, soda, juice, beer, and ale. However, these items will not get quite as cold as if you put them in a regular fridge. Some users employ this cooler as a cheese cave to age homemade cheeses, especially goat cheese. Others store their cigars with their wine, keeping an eye that the humidity doesn’t drop much below 70 percent. Is the Magic Chef 12-Bottle Wine Cooler Worth Buying? The Magic Chef 12-bottle wine cooler is the ideal appliance for casual wine drinkers who imbibe mostly red and white wines. If you’re a fan of sparkling, this may not be for you, due to size and temperature limitations. While this versatile unit will fit easily in many small nooks and cabinets, be sure to measure first before buying. The cooler’s dimensions are not the same as some counter-to-cabinet spaces. Also, know that the depth of the unit measures 33.2 inches with the door fully open. You will have to leave a bit of space at the back of the cooler to allow the vent to function properly. Otherwise, it will get a bit noisy, and the lack of ventilation could affect performance. The Magic Chef 12-bottle wine cooler is designed for indoor spaces. The warmer the ambient temperature, the more the unit will need to run to keep your wines cool. It is not made for use in a cold garage or unprotected outdoor kitchen. This cooler does not have a lock, so keep that in mind if you are concerned about underage people in your environment. But given its compact size, affordable price, and one-year warranty on parts and labor, it’s generally an excellent buy. Older PostWhat's the Best Wine for Cheese Fondue?